In the past, Hindi typing was a challenging task. For this we required to learn the Hindi typing. But nowadays we can easily type in Hindi using standard QWERTY keyboard. If we have internet connection then we can easily type in Hindi using few websites like- Hindi store or google translator. In Hindi Store, Just type words in English and then press space that will convert it in Hindi, if any changes required then press backspace and select the corresponding word from the list. If we are not connected to the Internet then still we can type in Hindi after installing the Google Transliteration IME. Google Transliteration IME is provided by the google and it is available in 22 different languages like– Amharic, Arabic, Bengali, Farsi (Persian), Greek, Gujarati, Hebrew, Hindi, Kannada, Malayalam, Marathi, Nepali, Oriya, Punjabi, Russian, Sanskrit, Serbian, Sinhalese, Tamil, Telugu, Tigrinya and Urdu. Below are the steps for installing the Google Transliteration IME. 1. Visit the Google Transliteration IME download page by Clicking here. a. 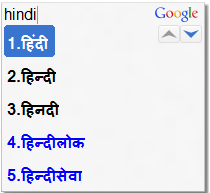 Now select the Hindi language. b. Choose the operating system type like- x86-bit or x64-bit. c. Now, click on download google IME. 2. After downloading, Just open the downloaded file that will install Google IME directly from the server. 3. Installation of Google IME will be completed in 3 to 4 minutes. 4. Now, We can view a language bar on the taskbar. We can choose the respective icons like- HI (for hindi) and EN (for english) for the typing. 5. Choose the HI (for hindi)from taskbar and open MS Word 2007 and start typing. The typing will be in hindi. This tools works everywhere only we need to enable the Hindi. We can type in Hindi everywhere like in facebook, any chat,any programs etc. Note- This tool internally use the mangal font for hindi and this font is widely accepted.